Countries participated in both fourth- and eighth-grade testing except where noted. On the other hand, National Assessment of Educational Progress (NAEP) tests are conducted in each state. A recent National Center for Educational Statistics study attempted to translate NAEP scores into TIMSS scores. The study found that average performance on a standardized fourth- and eighth-grade science and math test was better in many U.S. states than the international average. 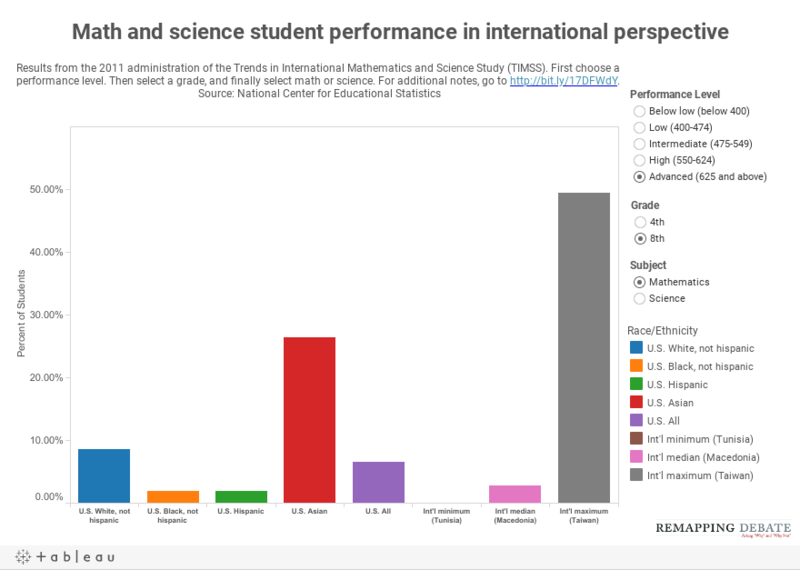 We decided to go back to the original TIMSS results and only look at those students from states, the United States overall, and other countries that actually participated in TIMSS. We were interested in creating a tool that allowed easy comparison between and among racial and ethnic groups in the U.S., alongside international comparisons. We also wanted to make sure that the results could be visualized at the different performance “bands.” TIMSS is reported on a scale of 0 to 1,000, with 500 set as the average score and standard deviation at 100. “Below low” represents students scoring less than 400; “low” represents students scoring from 400 to 474; “intermediate” represents students scoring from 475 to 549; “high” represents students scoring from 550 to 624; and “advanced” represents students scoring 625 or above. Click here for more information on what kind of achievement is demonstrated by each performance band. For the visualization on this page, select a performance level, grade, and subject. Note: in the “below low” category,” the international maximum is, literally, off the chart. Hover over the bar with your cursor to see the exact percentage of students. We also wanted to dig down into state-level performance. See the visualization on the next page.